Most of you have probably never heard of Gamependium, but it's a site I started back in 2005 when I was obsessing about Guild Wars and made a bunch of web utilities for it. 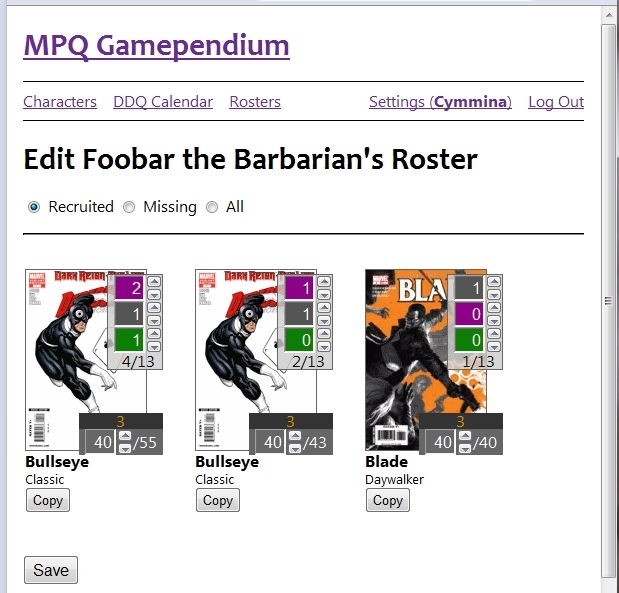 It's a bit of a long story as to why it's been down for the past several years, but I've started working on it again now that I'm obessing over MPQ. Simple overview of the upcoming DDQ prizes in a convenient calendar format (with the week starting on Monday, rather than Sunday). It will predict up until the end of the next rotation, with any new 3* characters tenatively inserted between the current rotataion and the next rotation. Predictions for upcoming characters are based on the most recent pattern. If the pattern changes (eg. Bullseye being inserted into the middle of the pattern), the calendar will remember this when predicting the next rotation. Adjusting the pattern is trivial, but it is something I have to do manually for now. There is also a convenient side-by-side list of what characters the next 10 tokens will be for, so you know how long to horde your tokens. The downside is that now you have to sign-up to use it (but registration is instant! for now, anyway). The 'rosters' page is currently only accessible if you're logged in, but all rosters are visible to the public if you can find a link to one (this is my roster). You might be thinking to yourself, "that all sounds great, but I have a roster created by your old tool, is there a way I can import it?" There certainly is! There's not too much to say about the character data. Other than the basic attributes (name, style, rarity, colors), you can see what builds are currently the most popular: Black Widow (Original). I just wanted to say thank you for all the work you've put into this. It was a little tiresome having to update my roster and signature before but I was still really glad it was there because it made it easy for people to see my roster. The new design and new features have improved it 100-fold and I just wanted to make sure you knew your work was appreciated. I definitely recommend others use this. Thanks again! Awesome work, and it has something that absolutely most other tracking features don't, the covers themselves! Speaking of which, some covers need to be updated: Star-Lord, Invisible Woman, Deadpool, Quicksilver, Ares, both 3* and 2* Daken. Duuuude, the DDQ forecast is so freaking awesome! I hadn't noticed it was pulling the data from your roster until today, when I noticed the Iron Fist was upcoming. Very cool! I love the new layout man, awesome work. 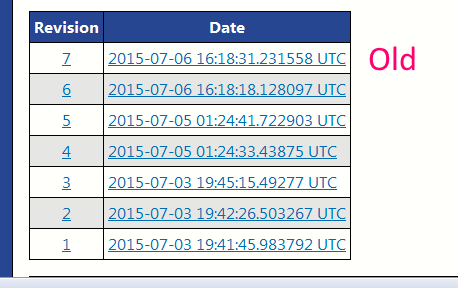 You have added so many new features and I love the DDQ forecast, finally I can see what DDQ tokens are odd/even. I have made my own spreadsheets and word docs to keep track of the daily drops but man you have just made it so much easier, thanks a ton! I'm glad everyone is enjoying the site so far. I'm currently working on showing the differences between roster revisions, but it's taking a lot longer than I expected. The big change here is that it only lists revisions where the number of covers has changed, not the levels. The number of revisions is also limited to 15 for now (I don't have enough data right yet to predict how well this will perform once the database grows). I don't know how important the skipped information is to you guys. Unless someone says otherwise, I plan on replacing the old revision list with the new one. Being able to access any revision you want is going to stay, just the links to certain revisions will go away. There was a feature I axed right before I launched the site that showed the upcoming even/odd tokens side-by-side, allowing you to see at a glance which round you want to horde your tokens for. Once it's confirmed that the Sweet/Savory tokens alternate in the same way as the old system, I'm going to be bringing it back. I know when I first did my roster last week I couldn't figure a couple of things out and I used some unnecessary saves. once you hit 15 versions do you just cycle off the oldest? don't want to mess the system up. I did another save today but should be once a week from here. got the copy function working though. Its awesome that you are adding in these features, I especially look forward to the odd/ even data (if it stays the way it was) as I am in a transition period where I am starting to accumulate a lot of covers but need to focus on ones I need not just ones that I am priming characters up for future use with. But I am also starting to get to the point where some covers are unneeded, for example: over the next 41 days (the remainder of this cycle and 2/3 of the next) there are 18 covers that I do not need, I will still do the DDQ for the iso, tokens, and sell the unneeded covers but If I can hoard the tokens for weeks where I need all covers then that is what I will do, great work drawing out a map of odd/ even tokens - keep up the great work! The saves will all still be there, just hidden from view. If the performance stays good, I'll increase it/add pagination. First things first, this is GREAT! If I could see my roster stats in the full calender, that would be incredibly useful and will make this complete. Also nice, sometimes I think d3 gives the most wanted cover colors not as often as other... you never know. great job on integrating our character builds into the forecast - love that feature. if it goes into the calendar even better, but its looking very good. thanks. I also need to drop a thanks for merging our roster's with the forecast, brilliant idea. I have mine like that on a MS Word doc just to see who is coming up but now I can just check the gamependium...awesome work man, keep it up. The site appears to be occasionally throwing an Internal Server Error while editing rosters, and I cannot reproduce this on my dev server. If anyone has encountered this problem, please send me a private message with any details you can. Everything is working fine on my end as I have not gotten the ISE yet. 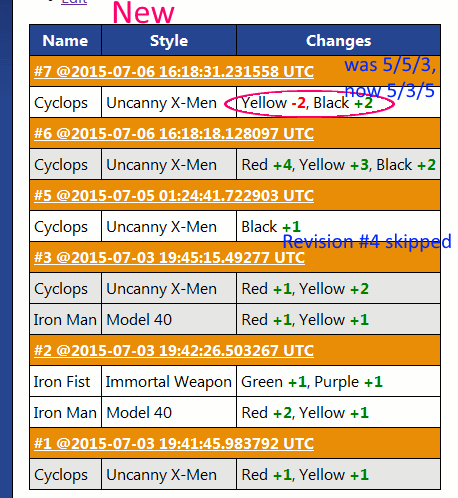 Just updated my roster, as I do on Friday's, and wanted to let you know that the icon for Jean Grey is available on the wiki now, I noticed it had not been added to the characters section, just a heads up. Thanks, I uploaded it a few hours ago. I just created my roster, and this thing is AMAZING. Thanks for all the work. Now I can finally make one of those "roster advice" posts that I'm sure everyone LOVES! Hey this is just great! Very nice job on the all thing, characters, forecast & the spreadsheet. Just one question, it's not allowed to have doubles!? Not allowed to have doubles where? I was trying to add a second Hood in my roster, but I don't know how. I absolutely love this web app, great for organizing and keeping track of my covers. I just added a black Elektra cover from 1/0/0 to 1/1/0. If I try to max her level to 74 given the covers I have and hit save, it spits this out: "Unknown unique constraint violation: roster_revision_levels_pkey"